Trainer David Pipe recorded a 5,995-1 Cheltenham four-timer, headed by Dell' Arca in the feature Greatwood Hurdle, on the final day of the Open meeting. Pipe started the day with the 40-1 shot Home Run winning the opening Conditional Jockeys' Handicap. The Liquidator (6-4) claimed the Supreme Trial Novices' Hurdle before Dell' Arca (12-1) landed his win. Red Sherlock (7-2 joint-favourite) completed a memorable day with victory in the closing Bumper race. "It puts the icing on the cake," said the delighted trainer. "This meeting means a lot to Pond House, the Pipe family, and DJ made it his meeting in the past. It's fantastic - these days don't happen very often in racing. "I'll never come across a man like him [Johnson]. He instilled confidence in me. No matter how much money he would have had on, he never put me under any pressure." Dell'Arca had shown promise in three hurdling starts in France and was bought by owner Professor Caroline Tisdall for 280,000 euros (£234,500). 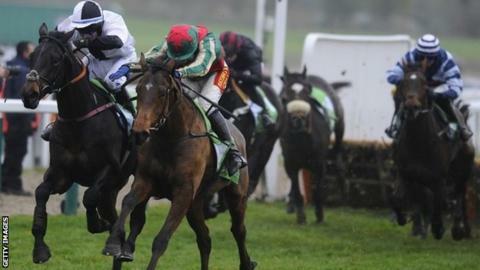 "He's still a novice and he's only won a handicap off a mark of 128 so we will enjoy today. I'm sure he'll get entries in all the big handicaps," said Pipe.